Eleven Saint Thomas thinclads earn selection to the 2018 Tangipahoa High School Girls All-Parish Cross Country Team. Donnes, Lucas, and Becerra earn first team selection. HAMMOND, LA—The Saint Thomas Aquinas Cross Country team posted eleven selections on the 2018 Tangipahoa High School Girls All-Parish Cross Country Team. Heading up the Falcon squad were first team selections freshman Breanna Becerra, and seniors John Ross Donnes and Logan Lucas. Earning Second Team selection were Emma Littell, Abby Bates, Jourdan St. Romain, Brynleigh Berthelot, and Douglas Robinson. Madison Robertson, Madelyn Nicaud, and Gavin Bankston received Honorable Mention honors. Donnes earns All-State honors finishing sixth overall a Class 2A State Meet. Young Falcons led by seniors Donnes and Lucas claim fourth place finish. Ladies finish fifth. Natchitoches, LA—Local Cross Country teams competed in Monday and Tuesda’'s 2018 LHSAA State Cross Country Championships on the campus of Northwestern State University in Natchitoches. The course was muddiest seen in the last thirty years as reported by coaches! It was wet, cold, windy and muddy on Monday and on Tuesday, the course was even worse, and the temperature were cooler. The Saint Thomas Aquinas boys posted a fourth place team finish in Class 2A, while the STA girls finished fifth on Monday. The Sumner girls were ninth in Class 3A, while the Sumner boys were twelfth on Tuesday. The Ponchatoula girls were ninth in Class 5A, while the PHS boys placed fourteenth in Tuesday’s races. The Episcopal boys captured the Class 2A team championship with (39), Menard was second (82), Country Day third (118), Saint Thomas Aquinas fourth (142), Lakeside fifth (148), Newman sixth (160), Rosepine seventh (253), Winnfield eighth (256), Delcambre ninth (282) and Avoyelles tenth (328) in the field of twenty-three teams. STA senior John Ross Donnes was the only local male Cross Country athlete to earn All-State honors at the sixth position (18:59), Logan Lucas was sixteenth (20:01), Gavin Bankston (35th-21:17), Douglas Robinson (41st-21:39), Brody Juneau (47th-21:59), Landen Schillage (66th-23:18) and Ethan Foster was 94th(24:51) for the Falcons. The Episcopal girls upset the Menard girls (44-50) to capture the Class 2A girls state title, while Louis McGehee was third (75), Newman was fourth (95), STA ffith (100), Country day sixth (202), Avoyolles seventh (215), Rosepine eighth (242), Dunham ninth (275) and Catholic-New Iberia was tenth (284) in the field of thirteen teams. Senior Abby Bates was the only local female Cross Country athlete to earn All- State honors at the ninth position (24:25). Madelyn Nicaud was sixteenth (24:56), Emma Littell was seventeenth (24:57), Breanna Becerra(24th-25:17), Madison Robertson (37th-26:37), Jourdan St. Romain (38th-26:44) and Brynleigh Berthelot was 39th (26:51). The Sacred Heart-New Orleans girls captured the 3-A girls state title with (26), University Lad was second (67), while the Jewel Sumner girls were ninth (253) in the field of nineteen teams. McKayla Lee led the Sumner girls with a twenty-eighth place finish (27:09), Madison Parfait was (38th-27:49), Abby Hodges (44th-28:40), Haley Stevens (50th-29:07), Madison Wood (104th-34:07), Karli Addison (118th-37:29) and Aiden Harrelson was 123rd (38:46). The Erath boys captured the 3-A boys team title with (67), while University Lab was second with (87) and the Jewel Sumner boys were twelfth (307) in the field of twenty-five teams. Ashton Blades led the Sumner boys with a 38th place finish (22:04), Andres Moreno was 50th (22:29), Colby Sloan (65th-23:25), Brayden Blalock (71st-23:53), Trinity Parfait (92nd-25:04) and Tanner Blades was 105th (25:31). The St. Joseph’s Academy girls captured the 5-A girls team title with (23) points, while the Mandeville girls were second (83) and the Ponchatoula girls were ninth (300) in the field of twenty-four teams. PHS senior Blair Vignes led the team with a twenty-second place finish in (24:12), Jayden Richard was 44th (25:06), Belle Vignes (65th-26:36), Paige Donaldson (86th-28:09), Jordan Louiviere (91st-28:38), Jayden Leblanc (106th-29:36) and Nora Biro was 107th (29:41). The Catholic-Baton Rouge boys team captured the 5-A team title with (47), Brother Martin was second (70) and PHS was fourteenth (385) in the field of twenty-four teams. 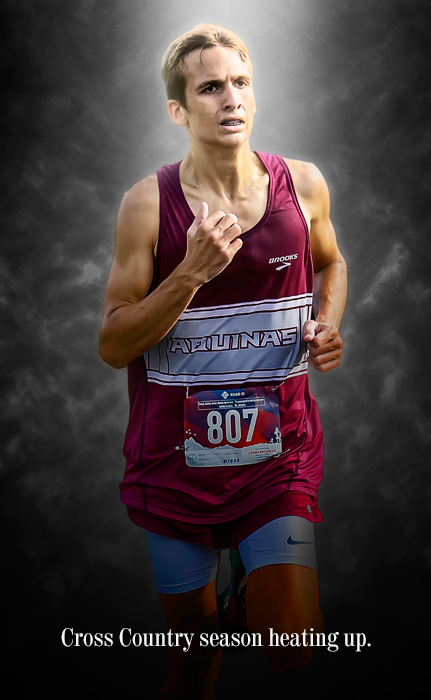 Senior Beau Hodges led the PHS boys team with a 33rd place finish (19:46), Shawn Farmer was 66th (20:46), Andrew Falcon (90th-21:29), Jacob Quesada (102nd-21:44), Colin Thibodeaux (108th-21:59), Breysen Dettwiller (121st-22:25) and Zak Beard was 140th (23:20). Donnes and Becerra pace Saint Thomas in Metro Championships. Senior John Donnes earn runner-up honors in field of over 180 runners. HAMMOND, LA—The annual Metro Cross Country Championships featuring 13 ladies teams and 16 men’s teams produced several top fifteen performances by Tangi squads. Belle Vignes and Blair Vignes of Ponchatoula finished fourth and fifth individually pacing a sixth place team finish by the Lady Wave. Breanna Becerra finished fourteenth to lead Saint Thomas. Sacred Heart Senior Mary Nusloch captured the individual title. Country Day won the JH boys team title with (30), while the Trafton Academy boys followed closely at second (38) led by a second place finish by Connor Franks. On the men’s side, John Donnes captured runner-up honors as Belle Chase’s Louden Boudreaux captured the individual title. Beau Hodges led the Ponchatoula with a sixth place finish in while Shawn Farmer followed closely at the seventh position. The Sacred Heart-New Orleans captured the Varsity girls division of the 2018 Northshore Metro Championships with a score of (32), Cabrini was second (87), Isadore Newman third (95), St. Thomas Aquinas fourth (124), Christ Episcopal fifth (150), Ponchatoula sixth (157), Metairie Park Country Day seventh (201), Belle Chasse eighth (244), Jewel Sumner ninth (253), Northlake Christian tenth (283), Archbishop Hannan eleventh (289), Lakeshore twelfth (298) and St. Amant was thirteenth (344). Sacred Heart Senior Mary Nusloch captured the individual title with a winning time of (18:04) on a very slow and muddy course, well ahead of teammate Olivia Boyd at the second position (19:21), while Svenya Stoyanoff (CES) was third (19:24). Locals making the podium were; Belle Vignes (PHS) 4th (19:52), Blair Vignes (PHS) 5th (20:01) and Breanna Becerra (STA) was 14th (20:52) in a field of 124 runners. Becerra led the STA girls, while Emma Littell was (21st-21:34), Abby Bates (24th-21:45), Madelyn Nicaud (34th-22:33), Jourdan St. Romain (50th-23:09), Madison Robertson (54th- 23:24), Brynleigh Berthelot (55th-23:26) and Chalah Rock (99th-27:43). The Vignes twins led the PHS girls, while Jordan Louivere was (51st-23:15), Paige Donaldson (67th-24:21), Jayden Leblanc (68th-24:25), Nora Biro (78th-25:19), Abigail Lesaichere (86th-26:00) and Bella Badeau was (95th-27:00). Abby Hodges led the Sumner girls (28th-22:02), McKayla Lee (46th-22:58), Madison Parfait (59th-23:44), Haley Stevens (70th-24:42) and Karli Addison was (126th-35:29). Belle Chasse captured the Varsity boys team title with (41), Ponchatoula was second (85), Isadore Newman third (110), Metairie Park Country Day fourth (111), Christ Episcopal fifth (124), St. Thomas Aquinas sixth (182), Lakeshore seventh (190), Pope John Paul eighth (235), St. Amant ninth (251), Ridgewood Prep tenth (270), Patrick Taylor eleventh (300), Jewel Sumner twelfth (315), Salmen thirteenth (343), Archbishop Hannan fourteenth (364), Bogalusa fifteenth (413) and Northlake Christian was sixteenth (456). Belle Chase Sophomore Louden Boudreaux captured the individual title with a winning time of (15:54), while STA senior John Ross Donnes was second (16:16) and CES freshman Jake Tournillion was third (16:31). Beau Hodges led the PHS boys with a sixth place finish in (16:50), while Shawn Farmer followed closely at the seventh position (16:59), Andrew Falcon was (21st-18:06), Jacob Quesada (23rd-18:08), Collin Thibodeaux (31st-18:18), Cooper Caldwell (34th-18:23) and Zack Beard was (37th-18:26). Donnes led the STA boys, while Douglas Robinson was (16th-17:49), Gavin Bankston (36th-18:24), Landen Schillage (65th-19:38), Ethan Foster (89th-20:41), Andrew Dawson (139th-23:37) and Brody Juneau was (148th-24:40). Albany’s Drew Thompson posted a podium finish at the tenth position (17:22), while Colby Sloan led the Sumner boys team (59th-19:13). Saint Thomas girls and boys capture Halloween Run titles. Freshman Breanna Becerra amd senior John Ross Donnes win individual titles. HAMMOND, LA—The Saint Thomas Aquinas girls Cross Country team captured the Varsity Girls team title in Thursday’s 2018 STA Halloween Run with (17), while the Jewel Sumner girls were second with (43). STA freshman Breanna Bceerra captured the individual two mile title on a rain-soaked and very muddy course with a winning time of (13:00). Sophomore Madelyn Nicaud was second (13:09), Abby Bates was third (13:25), Emma Littell fifth (13:55), Brynleigh Berthelot sixth (14:06), Jourdan St. Romain eighth (14:26), Madison Robertson tenth (14:53) and Chalah Rock was twelfth (16:22) for the lady falcons. Junior Abby Hodges led the Sumner girls team with a fourth place finish (13:38), McKayla Lee was seventh (14:08), Madison Parfait placed ninth (14:26), Haley Stevens eleventh (15:04) and Karli Addison was thirteenth (19:15). The STA boys edged-out the Jewel Sumner boys (30-33) to capture the Varsity boys team title, while Bogalusa was third (73). Senior John Ross Donnes was the individual champion in (10:50), while Logan Lucas was second (11:02), Douglas Robinson placed fifth (11:43), Landen Schillage eleventh (12:21), Ethan Foster fourteenth (13:39), Brody Juneau fifteenth (13:45), Andrew Dawson eighteenth (14:25) and Alec Dufriend was nineteenth (14:34) for the champion falcon team. Sumner’s Nick Story was third (11:26), Ashton Blades was seventh (12:04), Tanner Blades was eighth (12:07), Brayden Blalock ninth (12:12) and Colby Sloan was tenth (12:14). Albany’s Drew Thompson posted a fourth place finish (11:34), while Bogalusa’s Dustin Wagner was sixth (12:02). Saint Thomas ladies post Runner-Up finish in MC-Watson Ford Cross Country Invitational. Freshman Breanna Becerra led the way for the Lady Falcons with a seventh place finish. CLINTON, MS—The Saint Thomas Aquinas, Jewel Sumner high school teams and the Trafton Middle school teams competed in Saturday’s 2018 MC-Watson Ford Cross Country Invitational, which was held at the Choctaw Trails CC Course in Clinton, Mississippi. The STA girls posted a second place team finish in the Division II Varsity girls with (92) points, Kossuth was the champion with (79). St. Andrew's Episcopal was third (94), Hickory Flat fourth (154), Tupelo Christian Prep fifth (158), Jewel Sumner sixth (164), followed by; Choctaw Central (177), St. Patrick (199), New Site (208), Madison St. Joseph (229), Sterlington (236), Benton Academy (271), Claiborne Christian (308), Enterprise (382) and MS Palmer HS (428). The STA girls put four runners in the top thirty positions to earn the runner-up team award. Freshman Breanna Becerra led the way for the lady falcons with a seventh place finish in (21:50) for the 5000 meter hilly course. Senior Abby Bates was eleventh (22:07), Emma Littell was seventeenth (23:02), Brynleigh Berthelot placed 30th (24:05), Madison Robertson (38th-25:19), Jourdan St. Romain (41st-25:29) and Paige Bankston was 111th (32:34). Sumner Senior McKayla Lee led the cowgirls with a twenty-first place finish in (23:12.1), followed closely by teammate Abby Hodges at the 22nd position(23:12.6), Madison Parfait(31st-24:11), Haley Stevens (46th-25:53) and Madison Wood (72nd-27:50). Tupelo Christian captured the team title in the Division II race with (47), Kossuth was second (117), Choctaw Central third (133), West Lincoln fourth (152), Hickory Flat fifth (241), STA sixth (246), Lakeside seventh (255), St. Andrews eighth (263), Jewel Sumner ninth (274), followed by; Westminster Academy (283), St. Patricks (296), Sterlington (322), New Site(328), St. Fredrick (346), French Camp (387), Clarksdale (389), Madison St. Joseph (450), Loyd Star (461), JZ George (477), Vidalia (541), S.E. Lauderdale (550), MS Palmer (551), Claiborne Christian (554), Benton Academy (627) and Enterprise (726). STA Senior John Ross Donnes led the Falcons with a second place individual finish in (17:24), Logan Lucas was eleventh (18:35), Douglas Robinson (40th-20:28), Landen Schillage (77th-22:01), Ethan Foster (131st-424), Alec Dufriend (138th-24:51) and Andrew Dawson (146th-25:27). Sumner Senior Nick Story led the cowboys with a fourteenth place finish in (18:45), followed by; Brayden Blalock (47th-20:47), Trinity Parfait (61st-21:24), Colby Sloan (72nd-21:47), Tanner Blades (91st-22:40) and Andres Moreno (103rd-23:11). Saint Thomas competes in Gulf Coast XC Stampede. Senior John Ross Donnes led the team with a thirty-fourth place finish in (18:08). Pensacola, FL—The Saint Thomas Aquinas Cross Country teams competed in Saturday’s 2018 Gulf Coast XC Stampede held at the Escambia Equestrian Center in Pensacola, Florida. The St. Joseph Academy (BR) team captured the Varsity girls team title with (44), Harrison HS (Georgia) was second (138), Baker (Georgia) third (165), Mandeville fourth (174), Live Oak fourteenth (409), Cabrini seventeenth (463), St. Thomas Aquinas was twenty-second (593), Lafayette High twenty-third (612) and Parkview Baptist thirty-first (885) in the field of thirty-nine teams. Freshman Breanna Becerra led the lady falcons with a 88th place finish in a time of (22:59) for the 5000 meter race. Emma Littell was 106th (23:34), Brynleigh Bertelot (138th-24:26), Abby Bates (139th-24:28), Jourdan St. Romain (187th-25:32) and Madison Robertson was 193rd (25:37) in the field of 307 runners. The Harrison HS boys captured the Varsity boys team title with (63), Niceville was second (85), Beech HS (Tennessee) was third, Mandeville seventh (235), Jesuit eighth (264), Live Oak seventeenth (562), Saint Thomas Aquinas twenty-fifth (699) and Lafayette High was twenty-ninth(769) in a field of thirty nine teams. Senior John Ross Donnes led the team with a thirty-fourth place finish in (18:08) for the 5000 meters. Donnes was STA’s only medalist this weekend. Logan Lucas was 49th (18:24), Gavin Bankston (181st-20:18), Douglas Robinson (232nd-21:01), Landen Schillage (311th-23:42), Ethan Foster (337th-25:41), Alec Dufriend (339th-25:54) and Andrew Dawson was 350th (27:21) in a field of 360 runners. The STA team will be competing in next weeks St. Joseph Academy Invitational in Baton Rouge. Saint Thomas collects a pair of top finishes! Falcons in 2018 Saint Stanislaus Forester Commagere Hoka One Classic in Mississppi. Bay St. Louis, MS—The Saint Thomas Aquinas boys cross country team posted a second place team finish, while the girls team placed third in Saturday’s 2018 St. Stanislaus Forester Commagere Hoka One Classic held in Bay St. Louis, Mississippi at the St. Stanislaus Football Stadium. The St. Stanislaus boys captured the varsity team title with (44), STA was second (59), Lakeside third (62), Purvis fourth(93), Picayune fifth (115) and Sacred Heart-Hattiesburg was sixth (142). STA senior John Ross Donnes posted a second place individual finish in the two mile race with a time of (10:27), while senior teammate Logan Lucas was third in (10:30). Douglas Robinson was twelfth (11:48), Gavin Bankston placed sixteenth (12:12), Brody Juneau (28th-13:04), Landen Schillage (13:17), Ethan Foster (33rd-13:46), Andrew Dawson (35th-14:07) and Alec Dufriend was 39th (15:27). Picayunes Mason Wtson captured the individual tiel with a time of (10:22). The Sacred Heart-New Orleans girls captured the team title with (18), Cabrini was second (59), STA third (63), Sacred Heart-Hattiesburg fourth (117) and Our Lady Academy-MS was fifth (129). STA freshman Breanna Becerra led the lady falcons with a third place sprint to the finish with a time of (12:45.8) to runner-up Olivia Boyd(Sacred Heart-NO) ran (12:45.4) for the two mile varsity girls race.Senior Abby Bates was eleventh (13:50), Emma Littell was fourteenth (14:13), Brynleigh Berthelot was sixteenth (14:30), Madison Robertson (22nd-15:27) and Jourdan St. Romain (24th-15:38). Sacred Heart-N.O. senior Mary Nusloch was the individual varsity girls champion in (11:45). Falcons dominate dual meet with Ponchatoula. John Donnes takes first place followed by Logan Lucus in second and Douglas Robinson in fifth place. HAMMOND, LA—The Saint Thomas Aquinas girls edged-out the Ponchatoula girls (28-29), while the PHS boys edged-out the STA boys (28-29). The Varsity division of the BSN Sports Invitational was held on Friday with just STA and PHS competing in a duel meet.PHS freshman Jadyn Richard captured the varsity girls three mile race with a time of (20:45) on the extremely muddy course. Richard was followed by senior Blair Vignes at the second position (21:20). Senior Abby Bates led the way for the lady falcons with a third place finish (21:42), while freshman Breanna Becerra (STA) was fourth (21:56), Belle Vignes(PHS) was fifth (22:06), Emma Littell(STA) sixth (23:44), Brynleigh Berthelot (STA) seventh (24:05), Jourdan St. Romain (STA) eighth (24:49), Madison Robertson (STA) ninth (24:54) and Paige Donaldson (PHS) was tenth (25:29). STA’s senior John Ross Donnes was the Varsity boys champion in (17:10), while senior teammate Logan Lucas was second (17:20). Shawn Farmer (PHS) was third (17:28), Beau Hodges (PHS) fourth (18:49), Douglas Robinson (STA) fifth (19:24), Nicholas Drell (PHS) sixth (20:25), Cooper Coldwell (PHS) seventh (20:27), Collin Thibodeaux (PHS) eighth (20:45), Gavin Bankston (STA) ninth (20:46) and Breysen Dettwiller(PHS) was tenth (20:54). Freshman Breanna Becerra and senior John Ross Donnes pace Falcons in Memphis Twilight. Meet featured 344 females runners and 402 males. MEMPHIS, TN—The Saint Thomas Aquinas girls team posted a twenty-fifth place team finish in a field of forty-three teams in Saturday’s Memphis Twilight Cross Country Classic Invitational held at the Mike Ryan Soccer Complex in Memphis, Tennessee. Freshman Breanna Becerra led the lady falcons with a 97th place finish in (21:46) for the 5000 meter race that totaled 344 runners. Senior Abby Bates was 149th (22:45), Madelyn Nicaud was 170th (23:08), Emma Littell was 212th (24:00), Brynleigh Berthelot was 225th(24:30), Madison Robertson placed 277th (26:18) and Jourdan St. Romain placed 312th (28:37). The boys and girls teams will compete at STA on Friday night this week in a duel meet with Ponchatoula HS. The girls race will be at 4:00 pm, while the boys will run at 4:45pm. Saint Thomas dominates All-Tangipahoa Parish Cross Country Team. Sixteen Falcons earn parish honors. HAMMOND—Fresh off collecting a pair of LHSAA State Runner-Up trophies the Saint Thomas Cross Country dominated Tangipahoa All-Parish Team placing six thin clads on the first team and eight on the second team. Senior David Anthon, junior John Donnes, and junior Logan Lucas earned first team selection, while senior Nicole Francois, junior Abby Bates, and freshman Emma Littell collected first team honors for the Lady Falcons. Saint Thomas placed eight on the All-Parish Second Team along with two Honorable Mention selections. Tristan Robertson, Jude Vitrano, Dawson Gildig, Douglas Robertson, Brynleigh Berthelot, Yvette Miller, Maggie Crawford, and Madelyn Nicaud earned second team honors, while Madison Robertson and Chalah Rock collected Honorable Mention honors. Girls and Boys bring home the hardware! Falcon Cross Country collects a pair of LHSAA Class 2A State Runner-up trophies. NATCHITOCHES, LA—The St. Thomas Aquinas girls and boys cross country teams each captured runner-up state trophies in Monday’s 2017 LHSAA State Cross Country Championships held on the Northwestern Louisiana University Cross Country Course in Natchitoches. The Episcopal boys captured the Class 2A team title with (21), STA was second (59), Holy Savior Menard was third (76), Isadore Newman was fourth (163) and Lakeside was fifth (203) in the field of twenty-three teams. The STA boys had a pair of runners earn all-state honors, Senior David Anthon posted a fifth place finish in (16:41), while Junior John Ross Donnes posted a ninth place finish in (17:05). Dawson Gildig was fourteenth (17:31), Tristan Robertson was fifteenth (17:32), Logan Lucas placed sixteenth (17:36), Jude Vitrano was twenty-third (17:53) and Douglas Robinson placed thirty-third (18:41) for the falcons in a field of 169 runners. Vitrano was also honored as a 2017 LHSAA Composite All-State Academic athlete with a 4.0 GPA throughout his four years competing in cross country at STA. The Holy Savior Menard girls captured the Class 2-A title with (21), STA was second with (89), Louise McGehee was third (110), Episcopal fourth (118) and Isadore Newman was fifth (124) in the field of fifteen teams. Senior Nicole Francois led the lady falcons with a ninth place all-state finish in (19:43) for the three mile race. Abby Bates place twelfth (20:11), Emma Littell was twenty-first (20:54), Brynleigh Berthelot (25th-21:03), Yvette Miller (26th-21:11), Maggie Crawford (35th-21:57) and Madison Robertson was (58th-22:54) for the STA girls in a field of 135 runners. Miller was also honored as a 2017 LHSAA Composite All-State Academic athlete with a 4.0 GPA throughout her four years competing in cross country at STA. Anthon takes the Metro Title! Senior David Anthon finishes first in the annual 2017 Perfectly Fit Northshore Cross Country Championships. Abby Bates led the STA girls to the runner-up team title with a sixth place individual finish. HAMMOND—The Sacred Heart-New Orleans girls Cross Country team and the Belle Chasse High School boys captured the Varsity girls and boys team titles respectively in Tuesday’s 2017 Perfectly Fit Northshore Cross Country Championships held on the STA campus in Hammond. Sacred Heart junior Mary Nusloch captured the individual three mile varsity girls title in a winning time of 17:59 and Saint Thomas Aquinas senior, David Anthon, captured the individual three mile boys title. Nusloch captured the individual three mile Varsity girl’s title in a winning time of 17:59, which was 45 seconds faster than runner-up Molly McHale from St. Scholastica Academy at 18:44. Sacred Heart scored (34) to win the team title, while the Saint Thomas Aquinas girls were second (60), St. Scholastica Academy was third (74), Belle Chasse High School fourth (113), Cabrini fifth (120), Archbishop Hannan sixth (184), Ponchatoula seventh (209), Lakeshore eighth (214), Saint Katherine Drexel ninth (227), St. Amant tenth (294) and Franklinton was eleventh (342). Saint Thomas Aquinas junior Abby Bates led the STA girls to second place team finish with a sixth place individually at (19:50), Senior Nicole Francois(recent SLU commit) posted an eighth place finish in (20:01), Emma Littel was 18th (21:00.33), Yvette Miller was 19th (21:00.65), Brynleigh Berthelot was 20th (21:00.90), Maggie Crawford (32nd-21:37), Madison Robertson (51st-22:56) and Chalah Rock was (54th-23:15) in a field of 143 runners. Ponchatoula Junior Blair Vignes led the local finishers with a fourth place finish in (19:44) and Sumner Sophomore Abby Hodges was 29th (21:39). Also earning All-Metro Honors were; Svenya Stoyanoff (Christ Episcopal) 3rd (19:28), Jade Talazac (Belle Chasse) 5th(19:46), Cali Jane Luekemeier (Sacred Heart) 7th(19:55), Ivy Hunt(Christ Episcopal) 9th (20:12), Olivia Gaines (Sacred Heart) 10th (20:18), Madeline Kling (Sacred Heart) 11th (20:22), Olivia Boyd (Sacred Heart) 12th (20:30), Madisyn Acosta (Cabrini) 13th (20:46), Katie Callura (SSA) 14th (20:47) and Emily Leblanc (Sacred Heart) 15th (20:48). The Belle Chasse High School boys captured the Varsity boys team title with a score of 26, Saint Thomas Aquinas was second (44), Ponchatoula third (107), Lakeshore fourth (126), Sumner fifth (159), Christ Episcopal sixth (166), Archbishop Hannan seventh (206), Northlake Christian eighth (211), Pope John Paul ninth (215), St. Amant tenth (218), Salmen eleventh (310) and Franklinton was twelfth (368). St. Thomas Aquinas senior David Anthon captured the individual three mile title in (16:15), just three seconds ahead of Belle Chasse senior Alex Melcer in (16:18). Anthon led the STA boys with his victory to a second place team finish, Logan Lucas was fifth (16:33), John Ross Donnes was sixth (16:36), Jude Vitrano was thirteenth(17:21)Tristan Robertson placed nineteenth (17:45), Dawson Gildig was 20th (17:46) and Douglas Robinson was 24th (18:21). Sumner’s Nick Story was ninth (16:46), Ponchatoula’s Beau Hodges was twelfth(17:11) to lead local teams finishers in a field of 141 runners. Also earning All-Metro honors were; Paul Mantzel (Belle Chasse) 3rd(16:23), Alex Sucato (Belle Chasse) fourth (16:32), Louden Boudreaux (Belle Chasse) seventh (16:37), Brandon Shows (Lakeshore) eighth (16:39), Kyle Merchant (Belle Chasse) tenth (16:50), Jake Tournillion (Christ Episcopal) eleventh (17:09), Luke Acosta (Christ Episcopal) fourteenth (17:29) and Shawn Farmer (Ponchatoula) was fifteenth (17:31). The Trafton Academy girls captured the Junior High girls team title with (20), St. Peter was second (74), Roseland third (79), Heritage Academy fourth (101), St. Scholastica Academy fifth (109) and Archbishop Hannan was sixth (131). Trafton Academy eighth grader Breanna Becerra captured the individual two mile race in (12:53), while teammate Amelia Mistretta was second (13:39). Also joining Becerra and Mistretta on the winning team were; Alexis Pitts sixth (14:40), Jourdan St. Romain eighth (14:56), Presley Walls ninth (15:18), Ava Mistretta fourteenth (15:54) and Reese White was thirty-second (18:00). Local top runners were; Madison Parfait (Sumner) fifth (14:29), Aidan Harrelson(Roseland) sixteenth (16:02) and Trinity Adams (St. Helena) forty-first(19:13) in a field of 53 runners. Also earning JH All-Metro honors were; Sophia Dominguez (Christ Episcopal) third (14:07), Peyton Baker (St. Peter) fourth (14:12), Madi Berger (SSA) seventh (14:43), Macey Strickland (Christ Episcopal) tenth (15:30), Kaylee Collier(Heritage Christian) eleventh (15:34), Bethany Rayborn (Heritage Christian) twelfth (15:38), Addison Lee (St. Peter) thirteenth (15:49) and Lucia Englehardt (St. Peter) was fifteenth (16:02). St. Peter won the Junior High boys team title with (57), Roseland Montessori was second (76), Archbishop Hannan third (85), Sumner fourth (105), Bogalusa fifth (119), Maurepas sixth (142), St. Helena seventh (166) and Heritage Christian was eighth (170). Sumner eighth grader Andres Moreno was the individual winner in (12:20), he was eighteen seconds ahead of runner-up Stephen Miller (Bogalusa) at the second position in (12:38). Also earning JH All-Metro honors were; Keegan O’donnell (Hannan) third (12:41), Dallas Stricker (Heritage) fourth(13:06), Chad Hillstrom (Roseland) fifth (13:11), Trevor Landrew (Roseland) sixth (13:12), Henry Englehardt (St. Peter) seventh (13:13), Haiken Thompson (Bogalusa) eighth(13:20), Ben Wilson (Hannan) ninth (13:21), Dell Mokry-Montelaro (Hannan) tenth (13:22), Everett Enk (St. Peter) eleventh(13:42), Conlin Enk (St. Peter) twelfth (13:53), William Charles (St. Peter) thirteenth (14:26), William Kitchen (St. Peter) fourteenth (14:37) and Joshua Hanna (Maurepas) was fifteenth (14:39) in a field of 54 runners. Short-handed ladies earn top finish in STA-Dutchtown Cross Country Invitational. Nicole Francois led Lady Falcons with runner-up finish. HAMMOND—The Saint Thomas Aquinas captured the team title in Saturday’s 2017 STA-Dutchtown Cross Country Invitational held on the STA Cross Country Course. A total of 117 runners from seven different schools competed in the eighth annual event and endured the cold, windy and muddy course. Most of the STA boys were out this week taking the ACT, while two of the top STA girls were also taking the ACT. STA scored (18) for the team win, while runner-up Dutchtown had (49) and Archbishop Hannan was third with (65). Christ Episcopal seventh grader Ivy Hunt captured the individual two mile title in (13:00). STA senior Nicole Francois led the team with a second place finish in (13:11), freshman Emma Littell was third (13:22), senior Yvette Miller was fourth (13:31), junior Brynleigh Berthelot was fifth (13:39), sophomore Chalah Rock was twelfth (14:26) and freshman Madison Robertson was fourteenth (14:31). Sumner junior McKayla Lee posted a sixth place finish in (13:48), while sophomore teammate Abby Hodges was ninth (13:54). Dutchtown captured the Varsity boys team title with (25), Jewel Sumner was second (57), Christ Episcopal was third (69) and Archbishop Hannan was fourth (80). Dutchtown senior captured the individual two mile title in (10:41), just edging out STA junior John Ross Donnes at the second position (10:42). Sumner sophomore Nick Story was fourth (11:02), STA sophomore Douglas Robinson was tenth (11:53) and Sumner sophomore Ashton Blades was thirteenth (12:03). Cross County teams collect a pair of runner-up finishes. Boys and Girls Cross Country squads place second in annual 2017 STA-Rollette Chiropractic Cross Country Invitational. HAMMOND—The Belle Chasse boys captured the Varsity boy’s team title in this weeks 2017 STA-Rollette Chiropractic Cross Country Invitational held at the St. Thomas Aquinas Cross Country Course in Hammond. BCHS scored (23), while the host STA boys were runner-up with (52), Isadore Newman was third (86), Ponchatoula fourth (91), Christ Episcopal fifth (160), Pope John Paul sixth (187), Northlake Christian seventh (190), Sumner eighth (220), St. Amant ninth (220) and Maurepas was tenth (324). Belle Chasse senior Alex Melcer was the individual champion at (16:14) for the three mile race. STA senior David Anthon led the Falcons with a third place finish (16:35), John Ross Donnes was fifth (16:39), Tristan Robertson placed thirteenth (17:23), Logan Lucas was fifteenth (17:31), Douglas Robinson sixteenth (17:44), Jude Vitrano (21st-18:23) and Dawson Gildig was (40th-19:23) in the field of 118 runners. Nick Story led the Sumner boys with an eleventh place finish (17:07), while Beau Hodges led the Ponchatoula boys with a twelfth place finish in (17:11). Sacred Heart-New Orleans captured the Varsity girls team title with (40), STA was second (70), Belle Chasse third (107), Newman fourth (114), Cabrini fifth (122), Christ Episcopal sixth (128), Ponchatoula seventh (134) and St. Amant was eighth (222). Sacred Heart junior Mary Nusloch captured the individual victory with a time of (18:14). Ponchatoula’s Blair Vignes was the top local finisher with a seventh place finish in (20:01). STA senior Nicole Francois led the Lady Falcon attack with an eighth place finish in (20:10), Abby Bates followed closely at the ninth position (20:12), Brynleigh Berthelot was nineteenth (21:16), Maggie Crawford was 21st (21:23), Yvette Miller 26th(21:37), Madison Robertson 48th (23:25), Lilly Maggio 49th (23:48) and Chalah Rock was 54th (24:23) in the field of 98 runners. Cross County teams post top ten finishes. Senior David Anthon led the STA boys with an eleventh place finish and senior Nicole Francois led the STA girls with a 36th place finish. HAMMOND—The Saint Thomas Aquinas High School boys Varsity cross country team posted a fourth place team finish in Saturday’s 2017 St. Joseph Academy Cross Country Invitational held in Baton Rouge at the Highland Road Park Cross Country Course. The STA girls posted a seventh place team finish in the Varsity girls division. Episcopal captured the Varsity boys team title with a score of (48), Catholic High was second (50), Jesuit third (141), STA fourth (172), Fontainebleau fifth (178), St. Paul's sixth (197), Mandeville seventh (232), Live Oak eighth (257), ED White ninth (268) and St. Thomas More was tenth (294) in the field of 37 teams. Ponchatoula High posted a 19th place team finish (517). Senior David Anthon led the STA boys with an eleventh place finish in (16:11), Logan Lucas was 18th (16:29), John Ross Donnes 26th (16:49), Tristan Robertson 37th (16:58), Douglas Robinson 82nd(17:58), Dawson Gildig was 115th (18:43), the PHS boys team was led by Beau Hodges at 51st position (17:19), 276 runners competed. Saint Joseph’s Academy captured the Varsity girls team title with (61), Mandeville was second (90), Menard third (90), St. Michael's fourth (130), Academy of Sacred Heart-New Orleans fifth (191), Lafayette sixth (238), STA seventh (259), Mount Carmel eighth (261), St. Scholastica Academy ninth (284), Covenant Christian tenth (326) and PHS was 18th (458) in the field of 24 teams. Senior Nicole Francois led the STA girls with a 36th place finish (20:12), Abby Bates was 47th(20:26), Brynleigh Berthelot 53rd(20:43), Emma Littell 54th(20:43), Madelyn Nicaud 74th(21:33), Yvette Miller 86th(22:02) and Maggie Crawford was 94th(22:08) in the field of 202 runners. PHS Junior Blair Vignes posted a 22nd place finish (19:33), in the field of 202 runners. HAMMOND— The Saint Thomas Aquinas thin-clads dominated the Tangipahoa All-Parish Cross Country Teams with the boys placing four on the first team and the girls three with first team honors. Junior David Anthon was named the Boys MVP and was joined by juniors Tristan Robertson and Jude Vitrano, and sophomore Logan Lucas. Junior Nicole Francois was named Girls MVP and also earned LHSAA Class 2A All-State honors. Sophomore Abby Bates and senior Patricia Todd also collect first team honors. Saint Thomas Aquinas grabbed six of the ten second team spots as seniors Jordyn Neal, Meghan Becerra, Clayton Ourso, junior Yvette Miller, sophomores Brynleigh Berthelot, and John Ross Donnes earned second team honors. Senior Ellen Gambel, juniors Maggie Crawford and Dawson Gildig earned Honorable Mention. Falcon thinclads earn runner-up honors at State Meet. Saint Thomas boys bring home hardware with second place team finish in Class 2A. NATCHITOCHES, LA— The Saint Thomas Aquinas boys Cross Country team posted a second place team finish in the 2016 LHSAA Class 2A Cross Country Championships held Monday at the Northwestern State University Cross Country Course in Natchitoches, while the Lay Falcons posted a fourth place team finish. The Episcopal boys captured their 21st team title to win with (19), STA was second with (72), Holy Savior Menard was third (95), Newman fourth (132), Runnels fifth (138), Lakeside sixth (195), Country Day seventh (247), Haynes Academy eighth (253), Thomas Jefferson ninth (330), and David Thibodeaux tenth (335) in the field of twenty-eight full teams. Episcopal’s Graham Frazier was the individual winner in (16:00), while Lakeside’s Cody Robinson was second (16:10). STA Junior Tristan Robertson led the team with an eleventh place finish (17:11), David Anthon was twelfth (17:17), Jude Vitrano thirteenth (17:28), John Ross Donnes seventeenth (17:37), Dawson Gildig nineteenth (17:41), Clayton Ourso was twenty-fourth (18:00) and Logan Lucas placed thirtieth (18:14) for the Falcon runner-up team. The Menard girls captured the girls team title with (42), Episcopal was second (62), Newman was third (122), STA fourth (125), McGehee fifth (131), Runnels sixth (154), Lakeside seventh (168), Country Day eighth (179), Rosepine ninth (262) and Hannan was tenth (276) in the field of twenty-one teams. Lakeside’s Alissa Lander was the individual winner in (18:15), while Episcopal’s Alicia Stamey was second (19:00). STA Junior Nicole Francois earned Class 2A All-State honors by placing eighth (20:03), a seasonal best for her and the only STA girl to post a top ten finish this year at the state meet. Jordyn Neal was twenty-fifth (21:12), Patricia Todd (31st-21:37), Abby Bates (32nd-21:37), Yvette Miller (35th-21:54), Ellen Gambel (39th-22:00) and Brynleigh Berthelot was 41st (22:06). Falcon captures 2016 Northshore Metro Cross Country Championships team title! Saint Thomas junior David Anthon captured the individual title with a time of 16:37. HAMMOND—The Saint Thomas Aquinas boys Varsity Cross Country team captured Tuesday’s 2016 Northshore Metro Cross Country Championships team title with (37) points. Runner-up Belle Chasse High School also scored (37), so the scoring had to go to the six runner, STA’s sixth runner was fourteenth, while Belle Chasse’ sixth runner was twentieth to break the tie for the championship trophy. Ponchatoula High was third (108), Lakeshore fourth (112), Archbishop Hannan fifth (174), Dutchtown sixth (181), Holy Rosary seventh (189), Jewel Sumner eighth (192), Pope John Paul ninth (235), Salmen tenth (262), Mandeville eleventh (262), St. Amant twelfth (355) and Franklinton thirteenth (387). Falcon junior David Anthon captured the individual title with a time of (16:37), while runner-up Alex Lewis from Holy Rosary was second in (16:38) for the three mile race. Anthon led a STA boys who placed all eight runners in the top twenty-five positions to capture the team title. Tristan Robertson was fifth (16:57), Jude Vitrano ninth (17:24), John Ross Donnes tenth (17:29), Logan Lucas twelfth (17:36), Clayton Ourso fourteenth (17:40), Dawson Gildig twenty-fourth (18:39) and Douglas Robinson was twenty-fifth (18:39) for the Falcons. Ponchatoula’s Lucas Coleman was seventh (17:04) and Beau Hodges was fifteenth (17:52), while Jewel Sumner’s Nick Story was thirteenth (17:40) to earn All-Metro honors. The Academy of Sacred Heart captured the Varsity girls team title with (35), St. Scholastica Academy was second (61), Mandeville High third (76), St. Thomas Aquinas fourth (85), Cabrini fifth (149), Ponchatoula sixth (170), Lakeshore seventh (197), Archbishop Hannan eighth (219), Jewel Sumner ninth (236) and Dutchtown was tenth (301). Sacred Heart’s Mary Nusloch was the individual winner in (18:52), while teammate Madeline Kling was second (19:15). STA sophomore Abby Bates led the team with a tenth place finish (20:31), while Nicole Francois was eleventh (20:38), Patricia Todd was fourteenth (20:46), Yvette Miller (23rd-21:16), Brynleigh Berthelot (27th- 21:39), Jordyn Neal (28th- 21:46), Ellen Gambel (29th – 21:52), Maggie Crawford (31st – 21:54) and Chalah Rock (52nd- 23:21) for the lady falcons. Ponchatoula’s Blair Vignes led the team with a twentieth place finish (21:01), while Jewel Sumner’s Abby Hodges was thirty-fourth (22:14). SWEEP! Girls and Boys capture team title in STA-Dutchtown Invitational! Abby Bates and David Anthon pace wins. HAMMOND—The Saint Thomas Aquinas girls and boys won the Varsity division in Saturday’s STA-Dutchtown Invitational held on the STA Campus in Hammond. The Lady Falcons scored (31) to get the team victory over runner-up Dutchtown (37), while Jewel Sumner was third (66). Dutchtown’s Tara Stuntz was the individual winner in (12:05), while Lakeshore’s Haley Dean was second (12:59). STA’s Abby Bates led the team with a third place finish in (13:14), Brynleigh Berthelot was fifth (13:32), Ellen Gambel was eighth (14:01), Nicole Francois was ninth (14:06), Yvette Miller eleventh (14:08), Maggie Crawford twelfth (14:15), Jordyn Neal thirteenth (14:16), Chalah Roch seventeenth (15:20) and Laken Neal (32nd-18:04). Jewel Sumner’s Abby Hodges was seventh(13:53) and Alayna Herrington was tenth (14:06). The Saint Thomas boys captured the team title with (35), Lakeshore was second (45), Dutchtown third (50), Jewel Sumner fourth (105) and Franklinton was fifth (152). Lakeshores Brandon Shows was the individual winner in (10:50). David Anthon led the STA boys team to a team victory with a second place finish in (10:57), Tristan Robertson was third (10:58), Logan Lucas fifth (11:07), John Ross Donnes was ninth (11:13), Jude Vitrano was sixteenth (11:40), Clayton Ourso seventeenth (11:43), Douglas Robinson (23rd-12:05), Dawson Gildig (25th-12:09) and Mason Thompson (31st-12:39). Jewel Sumner’s Nick Story posted a twelfth place finish in (11:23). Saint Thomas Ladies finish third. HAMMOND—The Belle Chasse High School boys captured the Varsity boys team title in the 2016 STA-Rollette Chiropractic Cross Country Invitational held in Hammond with (29) points, while the St. Thomas Aquinas boys were second with (75), Ascension Catholic was third (98), Lakeshore fourth (106), Ponchatoula fifth (144), Fontainebleau sixth (152), Westminster Christian seventh (201), Walker eighth (218), Northlake Christian ninth (242), Jewel Sumner tenth (248), Hammond High Magnet eleventh (307) and Pope John Paul was twelfth (332). Holy Rosary Senior Alex Lewis was the individual winner in (16:45), followed closely by Ascension Catholic Junior Thomas Daigle at the second position in (16:48). STA Sophomore Logan Lucas led the team with a ninth place finish in (17:34), David Anthon was tenth (17:36), John Ross Donnes was fifteenth (17:55), Jude Vitrano (22nd-18:17), Clayton Ourso (24th-18:18), Tristan Robertson (33rd-18:52), Dawson Gildig (36th-19:05) and Caleb Stuart was 60th (20:24). Senior Lucas Coleman led the Ponchatoula boys with an eighth place finish (17:25), while Brandon Doucette (Hammond High) was 18th (18:01) and Nick Story led the Sumner boys with a 28th place finish in (18:30). The Academy of Sacred Heart-New Orleans girls captured the Varsity girls team title with (22), St. Scholastica Academy placed second (85), St. Thomas Aquinas was third (85), Ascension Catholic was fourth (143), Cabrini fifth (154), Ponchatoula sixth (155), Westminster Christian seventh (175), Belle Chasse eighth (180), Fontainebleau ninth (206), Lakeshore tenth (269) and St. Katherine Drexel Prep was eleventh (277). Sacred Heart Sophomore Mary Nusloch was the individual winner in (19:10), while Ascension Catholic senior Sophie Daigle was second (19:25). Sophmore Abby Bates led the STA girls with a twelfth place finish (21:12), Patricia Todd was twenty-first (21:55), Nicole Francois (24th-22:07), Brynleigh Berthelot (31st-22:26), Jordyn Neal (32nd – 22:27), Ellen Gambel (33rd- 22:30), Maggie Crawford (47th – 24:12) and Jourdan Cheek (93rd- 27:29). Blair Vignes led the Ponchatoula girls with a twenty-second place finish (21:56), while Abby Hodges led the Jewel Sumner girls at the 29th position (22:17). Cross Country competes in Catholic High Invitational. Walker Shootout set for October 15. BATON ROUGE —The Saint Thomas Aquinas girls and boys posted thirteenth and seventeenth place finishes repsectively in the annual Catholic High Invitational on Saturday. Lady Falcon Chalah Rock was (74th-15:11) and Laken Neal (176th- 17:02) in a field of 266 runners. Saint Thomas junior David Anthon led the team with a fifty-sixth place finish in (16:48), while sophomore Logan Lucas was sixth-sixth (16:58). The St. Joseph’s (BR) girls captured the Varsity girls team title with (87), Mandeville was second (113), Vanderbilt Catholic third (139), Menard fourth (145), Episcopal fifth (204), Sacred Heart-NO sixth (242), St. Michaels seventh (252), Dominican eighth (260), E.D. White ninth (310), Dutchtown tenth (326), Lusher Charter eleventh (341), Mount Carmel twelfth (379), St. Thomas Aquinas thirteenth (392), Parkview Baptist fourteenth (408), St. Thomas More fifteenth (448), followed by; McGehee (16th-480), St. Martin’s (17th-487), Ursuline Academy (19th-522), Cabrini (20th – 560), Newman (21st-565), Ascension Catholic (22nd-566), Ponchatoula (23rd- 577), Cedar Creek (24th-620), Assumption (25th-662), West Feliciana (26th – 699), University Lab (27th- 706), East Ascension (28th – 728), Hahnville (29th- 733), Hannan (30th -799), Zachary (31st – 833), South Terrebonne (32nd – 929), Central BR (33rd – 964), Woodlawn (34th- 967), Claiborne Christian (35th- 1003), Westgate (36th- 1070), St. Katherine (37th- 1078) and Broadmoor (38th – 1151). Junior Nicole Francois led the STA girls with a sixty-second place finish in (20:36), Abby Bates followed (70th- 20:47), Yvette Miller (86th – 21:05), Patricia Todd (87th – 21:06), Brynleigh Berthelot (111th – 21:38), Jordyn Neal (127th – 22:07) and Ellen Gambel (159th- 22:44). PHS was led by Blair Vignes (75th – 20:52), Lydia Pevey (89th- 21:09), Belle Vignes (121st- 21:52), Taylor Perrilloux (160th- 22:44) and de’Ette Mcabe (182nd- 23:16) in a field of 291 runners. The Brother Martin boys captured the Varsity boys team title with (73), Episcopal was second (93), Catholic High third (106), Holy Cross fourth (123), St. Michael fifth (162), ED White sixth (223), Mandeville seventh (327), St. Martins eighth (342), St. Thomas More ninth (356), Zachary tenth (392), John Curtis eleventh (398), Belle Chasse twelfth (417), Rummel Thirteenth (457), Menard fourteenth (470), Dutchtown fifteenth (506), Newman sixteenth (510), St. Thomas Aquinas seventeenth (513), they were followed by Cedar Creek (543), Ponchatoula (551), St. Louis (585), Slidell (586), Shaw (588), S.Terrebonne (605), Erath (605), Ascension Catholic (629), Hahnville (645), Vanderbilt Catholic (682), Pineville (694), Assumption (703), Westgate (785), Lafayette Christian (816), Woodlawm (882), Hannan (917), Holy Rosary (933), Carencro (958), E.Ascension (992), Covington (1021), Broadmoor(1051), University Lab(1121), Salmen(1125), Plaquemine(1147), False River(1147), White Castel(1183), Dunham(1225), Chalmette(1234) and Destrahan(1257). STA Junior David Anthon led the team with a fifty-sixth place finish in (16:48), while Sophomore Logan Lucas was sixth-sixth (16:58). Also joining the Falcons were; Jude Vitrano (17:22-91st), John Ross Donnes (18:08-131st), Clayton Ourso (19:13-192nd) and Dawson Gildig (20:07-246th). Ponchatoula was led by Senior Lucas Coleman (60th-16:53), Shawn Singh (90th-17:21), Beau Hodges (129th-18:06), Ian Waller (141st-18:19) and Jonathan Montz (153rd-18:33) in the field of 365 runners. Saint THomas freshman Douglas Robinson posted a forty-third place finish in the JH Boys race (12:28), while Courtney Christian’s Aidan Franks was forty-second (12:28) and Conner Franks was sixty-ninth (12:51). Cross Country competes in annual Gulf Coast Stampede. Abby Bates led the Lady Falcons and won the dance competition held for the runners after the race. PENSACOLA, FL—The St. Thomas Aquinas girls and boys Cross Country teams posted fifteenth place finishes in Saturday’s 2016 Gulf Coast Stampede held at the Escambia Country Equestrian Center in Pensacola, Florida. Niceville High School dominated the Varsity girls race with a team score of (26), while Harrison was second (110), Mandeville High third (129), Ocean Springs fourth (129), St. Paul’s Episcopal fifth (204), Darlington sixth (219), Scottsboro seventh (255), Spanish Fort eighth (270), Academy of Sacred Heart-New Orleans ninth (287), Grayson tenth (322), TR Miller eleventh (358), South Walton twelfth (371), Gulf Breeze thirteenth (373), Tate fourteenth (373), St. Thomas Aquinas fifteenth (390), Crestview sixteenth (404), Pace seventeenth (427), Roswell eighteenth (440), Ursuline nineteenth (464), Baker twentith (464), Bob Jones (21st-490), Choctawatchee (22nd-522), Country Day (23rd-559), Windmere Prep (24th-592), Arnold (25th-703), Davidson (26th-719), Foley (27th-721), Milton (28th-827) and Pine Forest was twenty-ninth (831). Sophomore Abby Bates led the Saint Thomas girls with a seventith place finish in (22:27) for 5000 meters. Nicole Francois was 81st (22:47), Yvette Miller (87th-22:56), Brynleigh Berthelot (88th-22:58), Patricia Todd (90th-23:00), Maggie Crawford (118th-23:48), Jordyn Neal (123rd-23:54), Ellen Gambel (130th-24:15), Jourdan Cheek (224th-28:44) and Laken Neal (226th-29:13). Trafton’s Breanna Becerra posted an eighth place finish in (22:30) in the JH/JV girls race. In the Varsity boys division Grayson High won with (77), Harrison was second (93), Jesuit third (167), Niceville fourth (172), Roswell fifth (175), South Walton sixth (180), Scottsboro seventh (181), Ocean Springs eighth (269), Gulf Breeze ninth (285), Mandeville tenth (288), Choctawatchee eleventh (295), Episcopal of Acadiana twelfth (346), Pace thirteenth (369), Bob Jones fourteenth (381), St. Thomas Aquinas fifteenth, followed by ; Spanish Fort (16th-478), Windmere Prep (17th-494), Darlington (18th-529), Pine Forest (19th-568), St. Paul’s Episcopal (20th-622), TR Miller (21st-630), Milton (22nd-660), Arnold (23rd-704), Crestview(24th-726), Davidson (25th-743), Holy Rosary (26th-743), Alma Bryant (27th-810), Paxton (28th-814), Escambia (29th-817), Country Day (30th-859), Foley(31st-893), Tate(32nd-897), Pensacola Booker T. Washington (33rd-905), D’Iberville (34th-947), Baker (35th-971) and Pensacola High was thirty-sixth (978). Sophomore Logan Lucas led the STA boys with a forty-ninth place finish in (17:55) for the 5000 meter race. Tristan Robertson was sixty-first (18:09), David Anthon (74th-18:23), John Ross Donnes (114th-19:04), Jude Vitrano (139th-19:27), Clayton Ourso (150th-19:40) and Douglas Robinson was 256th (22:43). Junior Tristan Robertson led the Saint Thomas. ABITA SPRINGS, LA—The Saint Thomas Aquinas boys placed seventh in the Varsity boys division in the 2016 St. Paul’s Christian Brothers Invitational. St. Paul’s boys captured the team title with (48), edging-out the Brother Martin team (50), Catholic High was third (73), St. Martin’s fourth (171), Mandeville fifth (178), Fonatainebleau sixth (183), STA seventh (221), Belle Chasse eighth (255), Zachary ninth (250), Newman tenth (264), Lakeshore (279), Archbishop Shaw (325) , Slidell High (339), Live Oak (409), Ponchatoula fifteenth (442), University Lab (504), Hannan (513), Covington High (515), Sumner (522), Albany (528), East Ascension (580), Northlake Christian (590) and Pearl River (604). The Lady Falcons posted a tenth place team finish. The Mandeville girls captured the team title with (26), St. Joseph was second (53), Dominican was third (128), Mount Carmel fourth (184), Fontainebleau fifth (186), Sacred Heart sixth (188), St, Scholastica seventh (190), Newman eighth (217), St. Martin’s ninth (261), STA tenth (264), Cabrini (11th-305), Belle Chasse (12th-310), Ponchatoula (13th-338), University Lab (14th-363), East Ascension (15th-421), Lake Shore (16th- 427), Live Oak (17th- 475), Hannan (18th – 525), Northshore (19th – 549), Slidell (20th -552) and Zachary (21st -563). Junior Tristan Robertson led the STA boys with a 30th place finish in (17:21), while Sophomore Logan Lucas followed closely at the 32nd position (17:23). David Anthon was 43rd (17:38), John Ross Donnes (55th -17:54), Jude Vitrano (80th – 18:35), Clayton Ourso (102nd- 19:32), Mason Thompson (129th- 20:26), Dawson Gildig (131st – 20:28), Douglas Robinson (133rd- 20:31) and Caleb Stewart (175th- 23:55). Sophomore Abigail Bates continues to lead the lady falcons, she posted a thirty-third place finish in (21:51) for the three mile sloppy course. Yvette Miller was 48th(22:21), Maggie Crawford (60th – 22:44), Patricia Todd (66th – 23:09), Brynleigh Berthelot (72nd – 23:14), Jordyn Neal (80th – 23:32), Chalah Rock (160th – 27:51), Jourdan Cheek (167th – 28:22) and Laken Neal (168th – 28:25). Sacred Heart of New Orleans and Lady Falcons finish in a thriller. Sacred Heart edges out Saint Thomas by one point in S & S Sports Center Cross Country Invitational. HAMMOND—The Sacred Heart of New Orleans girls edged-out the St. Thomas Aquinas Lady Falcons (28-29) in Thursday’s 2016 S & S Sports Center Cross Country Invitational held at the STA Campus in Hammond. Sophomore Abigail Bates led the STA girls with a third place finish in (13:40), while Yvette Miller was fifth (14:07), Brynleigh Berthelot sixth (14:08), Ellen Gambel seventh (14:15), Maggie Crawford eighth (14:17), Nicole Francois ninth (14:20), Chalah Rock (12th – 17:20) and Lakyn Neal (13th – 17:46). The Falcons Cross Country team captured the team title in Saturday’s Cabrini High School 6 Mile Relay Meet in New Orleans. NEW ORLEANS—The Saint Thomas Aquinas boys Cross Country team captured the team title in Saturday’s Cabrini High School 6 Mile Relay Meet in New Orleans. The foursome of Tristan Robertson, John Ross Donnes, David Anthon and Jude Vitrano captured the team title with a winning time of (33:35), they were followed by Belle Chasse HS (33:45), Newman (34:11) was third, Archbishop Shaw (34:41) fourth and the STA team of: Dawson Gildig, Logan Lucas, Mason Thompson and Clayton Ourso placed fifth (35:14). The Saint Thomas Aquinas girls Cross Country team posted a nineteenth place team finish in the Memphis Twilight Classis run under the lights at 8:00 pm in Memphis, Tennessee on Saturday. Daviess County (101) captured the team title in a field of thirty seven teams. Brookwood (118) was second, followed by Hoover (154), Francis Howell (182), Houston HS (198), Notre Dame HS (210), Jackson (218), Homewood (227), Festus (277), Parkway Central (279), St. Joseph’s Academy (285), Arlington (291), Franklin (327), Starkville (353), Madison Ridgeland Academy (427), Pearl (466), Farmington (472), Dyer Country (538), STA (585), Dresden (601), Collierville(609), Oxford (647), Bartlett (693), St. Benedict (701), Briarcrest Christian (711), Blackman (759), Germantown(759), Har-Ber HS (772), McLeod (774), St. Clair (789), St. George(828), Harding Academy(886), Greenville (1020), Bolton (1022), University (1033), MRA Red (1055) and Hutchinson School (1055). Leading the STA girls was senior Meghan Becerra with an 85th place finish in (21:23) for 5000 meters. Abby Bates(102nd - 21:41), Brynleigh Berthelot (149th- 22:45), Yvette Miller (157th- 22:59), Nicole Francois (152nd-23:07), Maggie Crawford (165th-23:16), Jordyn Neal (170th-23:26) and Patricia Todd(192nd-24:05). There were 298 runners in the Varsity race. Jordyn Cheek posted a 197th place finish in the JV girls race (29:17), while Chalah Rock was 100th (9:10) and Lakyn Neal was 120th (9:27) in the JH girls 2000 meter race. Annual Cross Country Camp set for August 8-12. Kindergarten through eighth are invited to sign-up today. HAMMOND—The annual Saint Thomas/Trafton Cross Country Camp is set for August 8-12 on the grounds of Saint Thomas. There will be games, relays, light weight training for older campers, guest speakers, camp t-shirt, a little bit of running, awards and a race on the last day of camp and swimming on Wednesday of camp. Daily schedule Monday through Wednesday is 8:30 am until 12:30 pm and on Thursday 3:30 pm-6:30 pm. Friday Race at 3:30 pm awards to follow. Becerra, Williams, and Todd headline All-State Teams. Ten Lady Falcons named to the Tangipahoa Area All-Parish Cross Country Girls Cross Country Team. BATON ROUGE—Fresh off a Class 2A State Championship the Saint Thomas Ladies Cross Country team received an array of individual honors as the LHSAA Composite, Class 2A All-State and Tangipahoa Area All-Parish Cross Country Girls Cross Country Teams were announced this week. Junior Meghan Becerra and senior Destiny Williams headlined the individual honors with each being named to the LHSAA Composite All-State Team. Becerra finished fifth at the State Meet with a time of 19:48.59, while Williams was seventh with a mark of 20:16.19. Junior Patricia Todd earned selection to the LHSAA Class 2A All-State team finishing ninth at State with a time of 20:25.43. Becerra was named MVP of the Tangipahoa Area All-Parish Cross Country Girls Cross Country Team and was joined on the first team by Williams, Todd, and freshman Abby Bates. The Lady Falcons dominated the second team as well as sophomores Yvette Miller, Maggie Crawford, Ellen Gambel	and freshman Brynleigh Berthelot earned spots. Rounding out the Tangipahoa Area All-Parish Team were junior Jordyn Neal and freshman Taylor Cardaronella who earned Honorable Mention. Seven Falcons named to 2015 Tangipahoa Area All-Parish Boys Cross Country Team. Dawson Gildig earns first team honors. HAMMOMND—The Saint Thomas Cross Country Teams dominated the selections to the 2015 Tangipahoa Area All-Parish Cross Country Boys Cross Country Team. Sophomore Dawson Gildig headed up the selections earning First Team honors while senior Hunter Dupre, sophomore David Anthon, and freshmen Logan Lucas and John Ross Donnes were named to the Second Team. Seniors Chris Freese and Alberto Valenzuela along with sophomore Jude Vitrano earned Honorable Mention. Lady Falcons capture Class 2A LHSAA State Championship! Boys place third in field of 27. HAMMOMND—The Saint Thomas Lady Falcons put five runners in the top twenty-five finishers as Meghan Becerra finished fifth to pace a Class 2A State LHSAA Championship at the annual State Meet hosted on the campus of Northwestern State University on Monday. David Anthon and John Ross Donnes finished twentieth and twenty-second respectively in the Boys Class 2A three-mile race to pace a third place finish for the Falcons in a field of 27 teams. Episcopal placed first with a score of 22, followed by Newman with 107, and the Falcons at 115. The Lady Falcons posted a score of 52 followed by runner-up Holy Savior Menard with 69 and Episcopal with 80. Becerra led the Ladies finishing with a time of 19:48.6 followed by four more Saint Thomas Ladies in the top twenty-five including Destiny Williams seventh (20:16.2), Patricia Todd ninth (20:25.5), Abby Bates fourteenth (20:44.3), and Yvette Miller twenty-first (20:57.4). Anthon led the Falcons with a twentieth place finish in a time of 17:37.8 followed by John Ross Donnes who clocked in at 17:42.8 finishing twenty-second. Logan Lucus was twenty-fourth (17:47.4), Chris Freeze twenty-sixth (17:51.3), Hunter Dupre twenty-eight (17:55.4), Jude Vitrano thirtieth (18:04.0), and Dawson Gildig thirty-second (18:05.07). Becerra and Gildig pace Saint Thomas in Metro Championships. Lady Falcons place third and Falcons finish fourth in eleven team field. HAMMOMND—The Mandeville High Varsity girl’s team captured the team title in Tuesday’s 2015 Northshore Metro Cross Country Championships held at the St. Thomas Aquinas Cross Country Course in Hammond. MHS scored (30) to edge-out Sacred Heart-New Orleans (39), St. Thomas Aquinas was third (79), Dominican fourth (133), Fontainebleau fifth (134), St. Scholastica Academy sixth (172), John Curtis seventh(183), Ponchatoula eighth (208), Slidell ninth (268), Northshore tenth (312) and Patrick Taylor Academy was eleventh (349). First Baptist senior Gabrielle Jennings a Furman University commitment captured the individual three mile title in (17:48) over Mandeville senior Olivia Murphy a University of Southern Illinois in Carbindale commitment at the second position (17:58). Meghan Becerra led the St. Thomas Aquinas girls team with a seventh place finish (19:36), while Destiny Williams was eleventh (20:04). Also competing for the Lady Falcons were Patricia Todd (17th-20:18), Abby Bates (24th-20:57), Yvette Miller (25th-20:58), Maggie Crawford (36th-21:22), Jordyn Neal(38th-21:29), Ellen Gambel (41st-21:41), Brynleigh Berthelot (44th-21:46) and Leighanne O’dowd (79th-23:39). Lydia Pevey led the Ponchatoula girls with a twenty-second place finish (20:49), followed by Blair Vignes (42nd-21:44), de’Ette McCabe (51st-21:59), Haleigh Habisreitinger (67th-23:04) and Annie Walls (74th-23:26). John Curtis Christian captured the boys Varsity team title with (31), Mandeville was second (62), Fontainebleau third (75), St. Thomas Aquinas fourth (97), Ponchatoula fifth (117), Slidell sixth (154), Northshore seventh (219), Northlake Cristian eighth (250), Salmen ninth (272), Patrick Taylor tenth (281) and Holden was eleventh (344). John Curtis senior Devyn Keith was the individual winner in (15:11), while Fonatinebleau’s Adam Wise was second (15:36). Sumner’s Austin Ballow was third (15:43), while teammate Austin James was ninth (16:20). STA’s Dawson Gildig led the team with a seventeenth place finish (17:01), Logan Lucas (21st-17:20), Hunter Dupre (22nd-17:23), Jude Vitrano (23rd-17:24), David Anthon (24th-17:39), John Ross Donnes (25th-17:41), Chris Freese (31st-17:53) and Alberto Valenzuela was 46th (18:26). Nicholas Randazzo led the Ponchatoula boys with a fourteenth place finish (16:37), Lucas Coleman was fifteenth (16:41), Bailey Usey (30th-17:51), Cody Chen (34th-17:56) and Ian Waller (37th-18:02). Ladies take first in Halloween Cross Country Invitational. Junior Meghan Becerra earns individual honors with a time of 12:37. HAMMOMND—The St. Thomas Aquinas Girls captured the Varsity team title in Saturday’s 2015 STA-Dutchtown Halloween Cross Country Invitational held on the Saint Thomas Campus. The Dutchtown boys captured the Varsity boy’s title, while the STA boys placed second. The Trafton Academy girls won the JH division, while the Jewel Sumner boys won the JH Boys team title. Athletes endured a muddy and windy course that was still wet from last week’s downpours. The Saint Thomas girls scored (22) to win over Dutchtown (39) and St. Katherine Drexel was third (85). Lady Falcon Junior Meghan Becerra was the individual winner in (12:37) in the two mile race, while Dutchtown’s Tara Stuntz was second in (12:50). The lady falcons put eleven runners in the top sixteen positions to claim the team trophy. Becerra led the way followed by Destiny Williams (3rd-13:06), Abby Bates (5th-13:15), Yvette Miller (6th-13:17), Patricia Todd (7th-13:20), Maggie Crawford (8th-13:34), Brynleigh Berthelot (9th-13:40), Ellen Gambel (10th-13:49), Jordyn Neal (11th-14:02), Taylor Cardaronella (12th-14:07) and Leighanne O’Dowd (16th-15:10) for the winning lady falcons squad. The Dutchtown boys claimed the Varsity boys title with (28), the Falcons second (35) and Runnels was third (68). Jewel Sumner’s Austin Ballow was the individual champion in (10:07), while Dutchtown’s Ben Vasterling was second in (10:19). Leading the Saint Thomas boys to second place finish was Sophomore Jude Vitrano at (11:13), followed by Logan Lucas (6th-11:15), Hunter Dupre (8th-11:21), David Anthon (9th-11:22), John Ross Donnes (12th-11:23), Chris Freese (15th-11:36) and Dawson Gildig was 24th (12:22) for the Falcons.